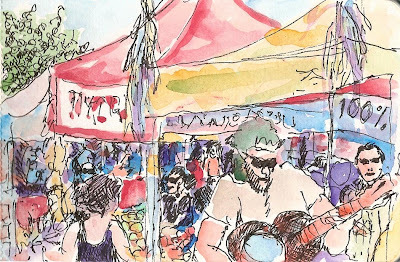 So -- Dave had this great idea to sketch at the Lake City Farmer's Market. What a perfect day in the heat and sunshine! The blues band mugged for the littlest kids, heckled the hecklers, and played "You Got to Move." Gets my vote! It was great to meet Dave, see just a few drawings (hope to see more later), compare favorite places, and see Gabi again. We agreed we'd post our drawings -- so Dave, now you're "it!" Looking forward to your sketch! i really like this tight view Beth, you also got the 100 % sign, how funny! Thanks, Gabi! It was kind of a 100% kind of day, maybe that was subliminal for all of us! This one captures the density of all the things going on. I like it.